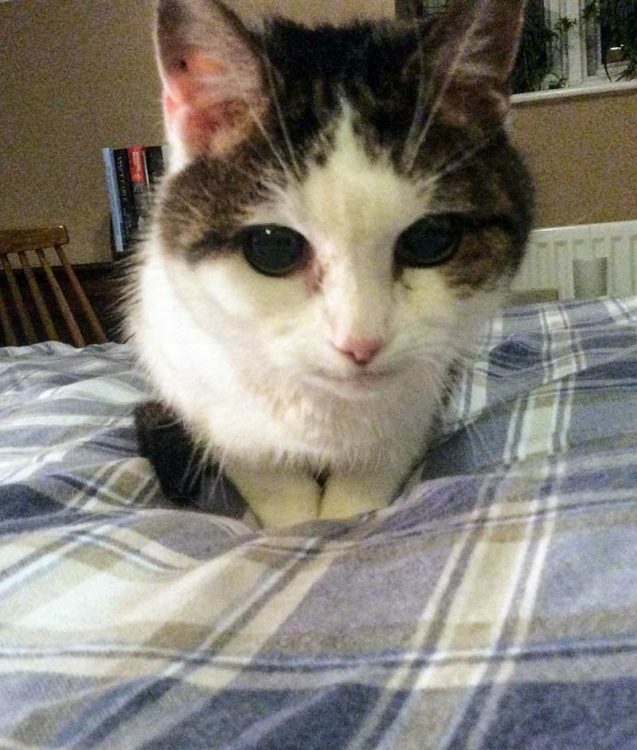 Blossom was an elderly, stray cat who had been seen living in the neighbourhood for about 9 months before moving in with Mr Saunders and his two cats Willow and Wilfred in October 2014. She settled in well but in October 2015 developed anaemia and Veterinary Surgeon Dee Collins hospitalised and treated her for this. At this point Dee discovered a small sore adjacent to her tail base. Unfortunately, this grew and became infected and after biopsies Blossom underwent surgery to remove it and another mass that was found at the same time. The tail mass was analysed and found to be a carcinoma, a potentially aggressive tumour. Thankfully early detection and treatment meant we were able to remove the mass completely and a follow-up scan in her abdomen showed no concerns of spread of the disease. Blossom recovered well from her surgery but in January 2016 came to see Dee again as she had suddenly started bumping into things at home. Examination of her eyes revealed that both retinae had detached from the back of the eyes and poor Blossom had gone blind. Blossom underwent a series of tests including blood tests and a heart scan to assess whether there was an underlying cause to the high blood pressure and also to assess whether further organ damage had occurred. We were happy that all the tests proved normal and Blossom started a daily tablet for her high blood pressure. She coped very well with her reduced vision and was able to lead a very happy life as an indoor cat.